On Jan. 30 2019, Lunar Reconnaissance Orbiter Camera (LROC) acquired a spectacular limb shot centered on the Chang'e 4 landing site, looking across the floor of Von Kármán crater. 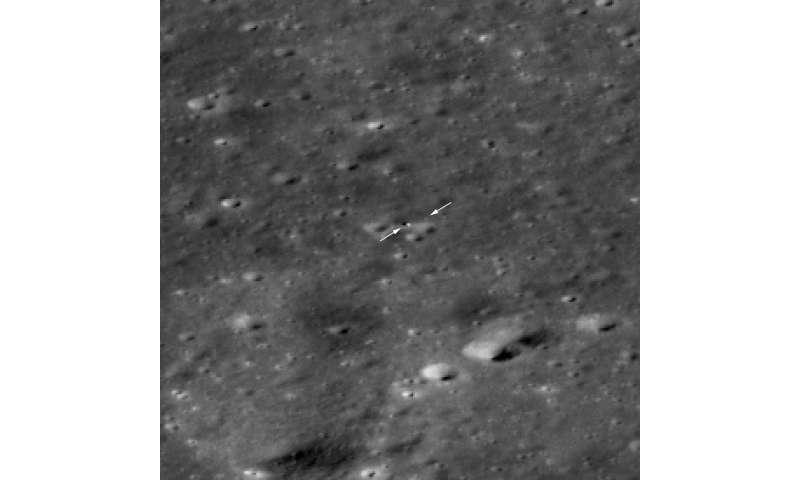 At the time, the Lunar Reconnaissance Orbiter (LRO) was more than 200 kilometers from the landing site so Chang'e 4 was only a few pixels across and the rover was not discernable. 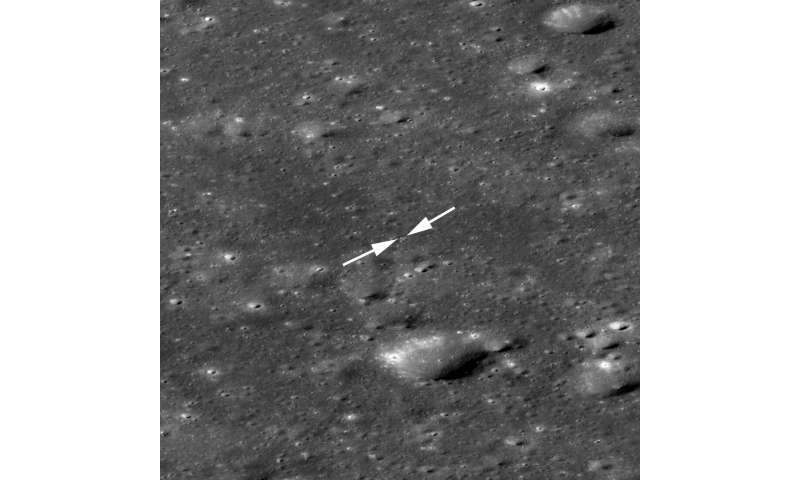 The following day LRO was closer to the site and again slewed (59 degrees this time) to capture another view. This time the small Yutu-2 rover shows up (two pixels) just north of the lander. Also, shadows cast by the lander and rover are now visible. At some time after the formation of Von Kármán crater, the crater floor was covered by eruptions of basaltic lava, similar to the eruptions in Hawaii last summer. Chang'e 4 will collect compositional measurements of these farside basaltic rocks, and lunar scientists are anxiously awaiting these results. Do volcanic rocks on the farside differ from the basalts collected from the nearside? We will have to wait and see! A striking aspect of the floor of Von Kármán crater is the number and variety of impact craters. There is a high density of craters because the surface is more than 3 billion years old! During those 3 billion years, so many small craters (<200 meters (660 feet) in diameter) formed that when a new one forms, the total number of craters does not increase. This seemingly counterintuitive situation occurs because each new crater erases, on average, one older crater of comparable size, a state known as "equilibrium" to crater counting geologists. For surfaces this old (in equilibrium), only larger craters (>1000 meters (3280 feet) diameter), which are not in equilibrium, continue to increase in density and can be used to estimate the age of the surface. Note also all of the small craters that have formed on top of larger ones. Smaller impacts wear down and degrade larger craters over time. You can easily see a wide variety of crater degradation states, ranging from sharp and crisp (new) to highly degraded (old). As result of all of these impacts (small and large), the surface of the Moon consists of a very fine powder known as regolith, in which the Apollo astronauts made their distinct boot prints. LROC is a system of three cameras mounted on LRO that capture high resolution photos of the lunar surface. No, now there is information to be gotten from this latest Chang'e Twitter release. Human Papiloma Virus - HPV-2 (of almost 200 types) is very commonly found on the hands. Apparently sterile-clean conditions failed during Chang'e assembly. HPV is endemic in the human population and almost always resolves spontaneously. The notable types and cases are lifestyle related diseases. Wow, there are conspiracy theorists who believe China never launched a space probe to the far side of the Moon, or that it didn't have a rover? I ain't all hot on China, but that's disgraceful. Such individuals need to go spit in the barrel fire in their trailer park. They would be making the most meaningful comment of their lives. Just report them. And don't report anything else, and don't comment on them. The mods are pretty good about removing spam. There's no point in railing against it; the spammer will never see your reply.